Elodie Holmes is the owner and head artist at Liquid Light Glass. She founded the company in 1986 and went on to establish the Baca Street Arts district in 2000. Since then she has focused on providing opportunities to local artists, internships for local high school students, and classes for the public. In addition to supporting the arts community, Holmes is an internationally acclaimed artist. In 2016 she received the New Mexico Governor’s Award of Excellence in the Arts in recognition of her achievements. Her work has appeared in galleries, permanent collections, museums, and private collections around the world. To learn more about Elodie Holmes, please visit her personal website: www.elodieholmes.com. Marcy Albin has served as the gallery manager at Liquid Light Glass for almost two decades, and has 25 years of experience in her field. Marcy’s expert knowledge of sales and glass art make her an indispensable member of the Liquid Light Glass team. She manages every aspect of the gallery, including shows, classes, and special events. Jannine has spent her entire life in the arts. After working as an illustrator for over a decade Jannine moved to Santa Fe, where she met Elodie Holmes and fell in love with glass blowing. Under the tutelage of Holmes, Jannine learned how to adapt her design skills and vibrant color palette to this new medium. Now Jannine puts her 15 years of glass art experience to work making her own art, teaching classes, and assisting Holmes in the hot shop. Cia Thorne is an accomplished glass sculptor whose work appears in galleries nationwide. She attended California College of the Arts and has trained with glass masters Pino Signoretto and Martin Janecky. Thorne currently shows her work and teaches classes at Liquid Light Glass. Al Leedom is an established glass artist who ran his own studio and gallery for over a decade. He and Holmes are close artistic collaborators and met while working with Peter Vanderlaan in the early 1990s. Leedom presently teaches classes and exhibits his work at Liquid Light Glass. John discovered Contemporary Studio Glass while working as a Sound Engineer in Seattle. Eventually he got to know many of the local artists and began his own glass collection before relocating to the Southwest. He continues to cultivate his passion for glass art by studying glass blowing and working in the gallery. Sabina is an emerging glass artist who has worked internationally as a glass assistant and community arts coordinator. 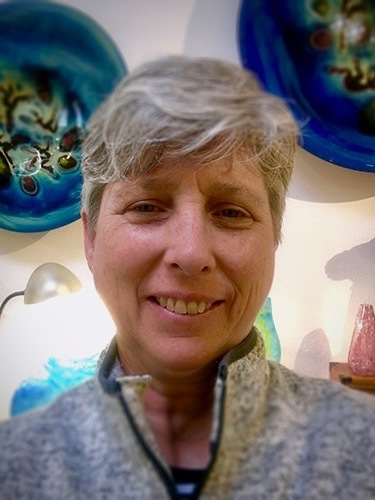 She currently works as a glass artist at Tesuque Glass and trains with Elodie Holmes at Liquid Light Glass, where she also works as a gallery assistant, and teaches classes.